The global prefilled syringe market is expected to reach $6.36 Billion by 2021, up from $3.93 Billion in 2016.1 Growth drivers in the market are an increasing prevalence of chronic diseases, escalating adoption of self-injection devices, technological advancements in the drug delivery platforms, and effectiveness of the prefilled syringes. Also gaining momentum in the market is a shift in parenteral packaging from glass to plastic prefilled syringes because of advanced polymer materials such as polypropylene and crystal-clear polymer, which are biocompatible with the other components of the syringe. This annual Drug Development& Delivery report highlights some of the key players in the market and where they are focusing their efforts to ensure products are of the highest quality, safe, and easy to use. Pharmaceutical companies are increasingly looking for ways to eliminate the risks associated with contamination. Specifically, the focus has been around reducing the level of particulates found in drug product. This focus on particulates is raising the bar for all players associated with the development and manufacturing of injectable products, with attention targeted towards a zero-defect achievement. Aptar Pharma has addressed this trend with the development of its Premium portfolio of injectable components: Premium-Fill®, PremiumCoatTM, and PremiumVisionTM. “PremiumFill is a guaranteed specification to Aptar Pharma’s high quality of production, resulting in lower embedded particles, improved particulate cleanliness, and an overall reduction in defects,” says Adam Shain, Director, Global Business Development – Injectables, Aptar Pharma. Also produced with the PremiumFill guarantee is PremiumCoat, the new standard for film-coated stoppers. And, PremiumVision uses an in-line automated vision inspection system designed to further validate against critical defects and offers the ability to customize and further reduce the particulate level guarantee for PremiumFill. Aptar Pharma’s services and development capabilities have proven successful for Next Breath, a full-service cGMP analytical service company. Recently, Next Breath expanded its development services to injectable delivery systems with a core focus on extractables and leachables. Next Breath works with customers to define the characteristics of elastomeric components that are best suited for their drug product, assess functionality for the intended use, examine extractables and leachables, and determine physical and chemical compatibility. “This systematic approach makes Next Breath services ideal for any company looking to accelerate their development timelines for regulatory filing,” says Mr. Shain. In the area of autoinjectors, Catalent supports combination device assembly. This begins with early clinical device assembly and progresses through builds needed to support human factors assessments and design verification all the way through qualification and commercial launch/production, says Mr. Galliher. There is the continued drive from pharma customers to differentiate their drug-device combination products in a crowded and competitive market place. Credence MedSystems is helping its customers differentiate their drug products through innovative delivery systems while preserving their trusted processes, thereby making differentiation through drug delivery safer, more achievable, and less disruptive, explains John Merhige, Chief Commercial Officer, Credence MedSystems. 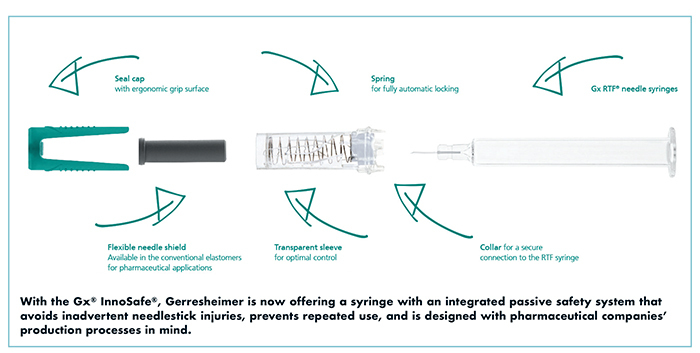 Primary packaging components are critical for pharma customers, and Gerresheimer believes that glass will prevail in the market, as pharma understands the benefits and drawbacks of glass syringes. “They understand the risks, and are aware of improvement in glass with regard to composition and the processing,” says Bernd Zeiss, Manager Technical Support Medical Systems at Gerresheimer Bünde. Aside from glass syringes, Gerresheimer offers the Gx® RTF Clearject® syringe, a high-end syringe made from break-resistant COP with advantages over glass, such as high tolerance and glue-free needle mounting. Polymers like COP have found their specific fields of applications in biotech and aesthetics. Gerresheimer is continuously upgrading its process capabilities with next-generation technologies like the Gx 3G camera system for reliable detection of dimensional and cosmetic defects. New features are a highly accurate dose marking for very small injection volumes and the use of a ceramic pin in metal-free cone forming to avoid tungsten. “We also put effort into reducing free silicone oil with improved baked-on siliconization processes,” says Mr. Zeiss. 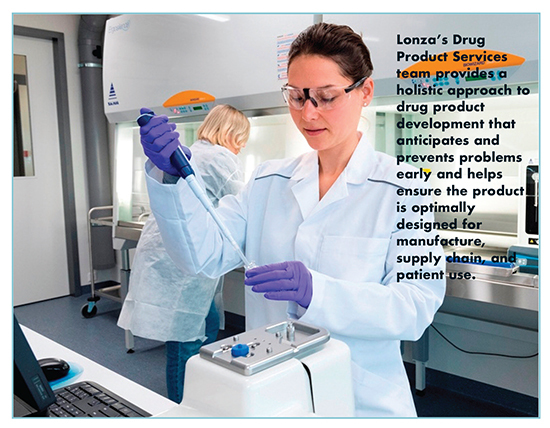 Lonza Pharma & Biotech’s Drug Product Services (DPS) organization helps to develop products and drug/device combination products for parenteral administration. In addition, they can specifically address issues related to formulation, excipients, active ingredient, process, container closure, and device interaction as they relate to product stability. Issues related to container and device can include delamination, fogging, injection force variability, particle assessment, surfactant-mediated, and comparability exercises. Many biologic drugs, such as monoclonal antibodies or antibody fragments, require a sufficiently large dose when administered subcunatenously (s.c.) or intravireally (i.v.t.) (intraocularly). Products for i.v.t. administration have specific requirements, both considering maximum injection volume and usable needle sizes and configurations. This leads to high concentration formulations that have specific challenges in product design and manufacture, including increased aggregation and particle formation, and significant increase in viscosity, which can impact the ability of manufacture and administer. “We have supported various customers for the development of high- concentration products for s.c. and i.v.t. administration, overcoming these challenges and enabling them to enter clinical development quickly with the ability to manufacture and administer, and making these products also commercially viable,” says Prof. Dr. Hanns-Christian Mahler, Head, Drug Product Services, Lonza Pharma & Biotech. The DPS team provides a holistic approach to drug product development that anticipates and prevents problems early and helps ensure the product is optimally designed for manufacture, supply chain, and patient use in full compliance with global regulatory requirements and expectations. The DPS team provides a complete portfolio of services for parenteral dosage forms, including products for injection and infusion for intravenous, subcutaneous, intraocular, and other routes of parenteral administration. These offerings also include specialized services, such as: particulate identification; characterization and quantification; excipient and surfactant characterization; extractables and leachables assessment; and container closure integrity testing. The shift from large blockbuster drugs to more targeted treatments, including biologics, has elicited two consequences for pharma manufacturers. First, they must make their filling process more flexible to meet the growing market demands. Second, the biologics are highly sensitive and require special packaging to ensure drug stability, says Dr. Nicolas Eon, Global Product Manager, SCHOTT Pharmaceutical Systems. SCHOTT has addressed this trend by introducing the iQ™ platform, which standardizes the tub format of syringes, vials, and cartridges to run on one filling line with reduced changeover times. 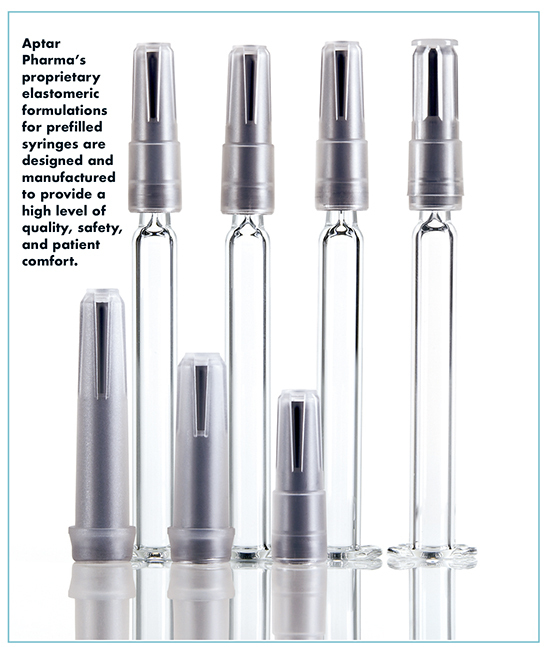 The newest member of the iQ family is syriQ BioPure®, a prefillable glass syringe designed to keep highly sensitive and complex drugs stable during shelf life and ease administration. 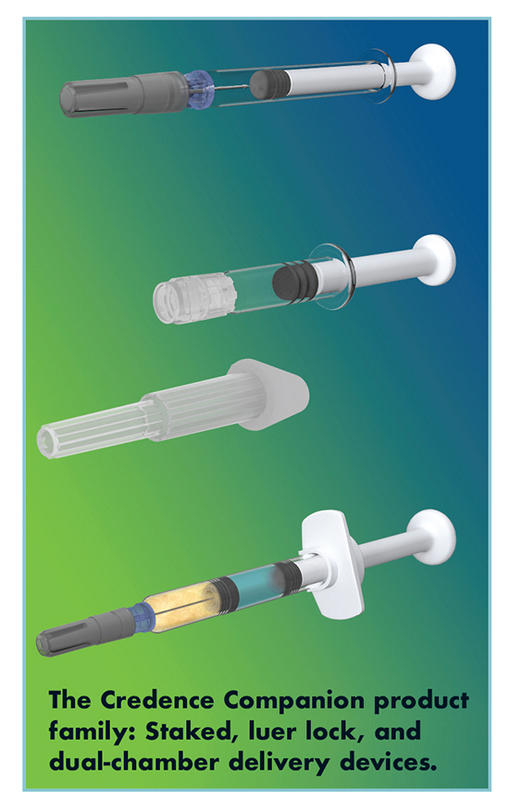 SCHOTT offers more than 48 pre-validated configurations with elastomer components for the new syriQ BioPure syringes. 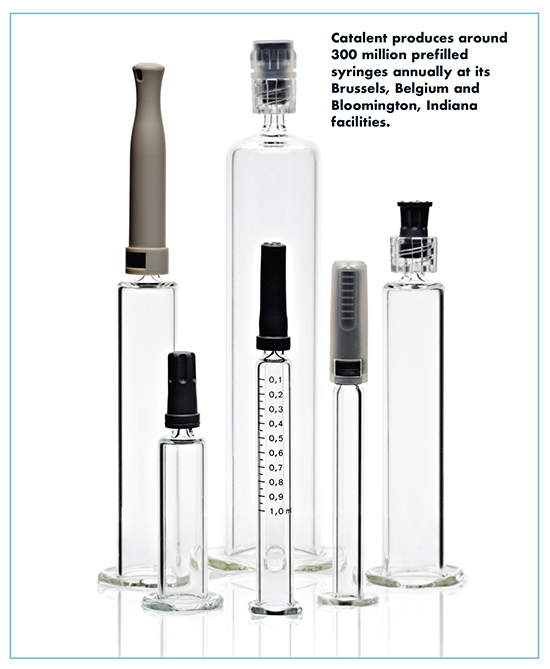 Moreover, accurate dimensions of the syringes allow for optimal device compatibility, which enable home treatments. CDMOs today need to advance their aseptic processes and technologies to meet the competing demands for the highest levels of quality and flexibility. One means of accomplishing this goal is to combine the advantages of the two commonly used techniques for aseptic manufacturing within the industry today – isolators and restricted access barrier systems (RABS). Combined, they help in an enhanced way to improve quality, safety, and flexibility in the aseptic filling process while making processes more efficient at the same time. Vetter has devised such a solution called Vetter CleanRoom Technology VCRT®, incorporating a number of innovations that result in improved operation in aseptic manufacturing, explains Bernd Stauss, Senior Vice President Pharmaceutical Production/Engineering, Vetter Pharma-Fertigung GmbH & Co. KG. “The system includes a fully automated H2O2 decontamination process of the entire cleanroom within a uniquely fast – approximately less than 3-hour cycle – to avoid microbial contamination and to achieve the highest safety level possible,” he says. “Continuous online monitoring of several variables helps ensure the effectiveness of the decontamination process. 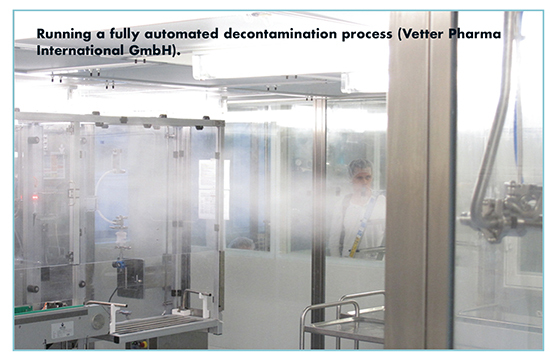 The overall equipment effectiveness of RABS, combined with the sterility assurance level (SAL) of an isolator, achieves high operational efficiency.” Vetter will implement this decontamination concept in all of its cleanrooms within the next few years. There is growing interest in the use of polymer syringes for ocular injections, such as those used to treat wet age-related macular degeneration (AMD). Along with its partner, Daikyo Seiko, West has been developing and supplying Daikyo Crystal Zenith® systems for use with many marketed drugs. The Crystal Zenith syringe offers advantages for ocular injections, including the absence of silicone oil, high cleanliness, and the use of a fluropolymer-filmed plunger that reduces drug interaction. “The precision of the system may help to improve break-loose and gliding forces, and provide increased control and comfort to the clinician while injecting into the eye,” says Graham Reynolds, Vice President and General Manager, Global Biologics, West Pharmaceutical Services, Inc.
At the heart of the system is a Daikyo Crystal Zenith container, combined with Flurotec® closures to enhance the security of the drug product and optimize performance. 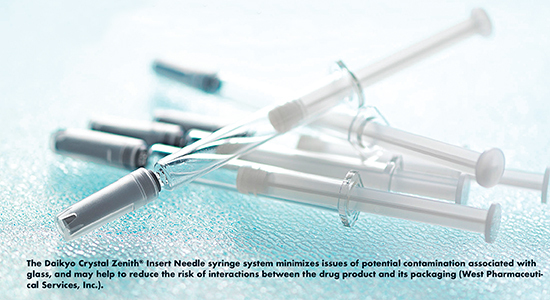 This is important, says Mr. Reynolds, as self-injection of biologic drugs can be challenging, especially as molecules become more complex, dose volumes increase, and dosing frequency is reduced to improve patient convenience. Taking an integrated approach to the development of drug delivery systems, West has developed systems such as the SmartDose® drug delivery platform, which offers fully integrated containment and delivery systems for the self-administration of biologic drugs. SmartDose allows patients to self-administer medication in accordance with their prescribed treatment. “West developed the SmartDose drug delivery platform with extensive human factors testing and analysis to understand the interaction between the patient and the delivery system,” says Mr. Reynolds. The SmartDose drug delivery platform adheres to the patient’s body, usually on the abdomen, so patients can be hands-free during administration. “The market demand for biologics, coupled with the growth of self-administration, required the drug delivery sector to develop new innovations to administer these therapies, such as the West Smart-Dose technology platform,” says Mr. Reynolds. ZebraSci is noticing increasing interest in adding Container Closure Integrity Testing to its primary container characterization programs. “In addition to assessing the variability in critical geometries for container components, such as syringe barrels and pistons, adding a sensitive leak testing method like helium leak detection upfront in the development phase allows you to gage the inherent integrity of the packaging system,” says Eric Creveling, Director, Laboratory Services, ZebraSci. He adds that helium leak detection can help determine the relationship between a specific syringe barrel/piston combination, as well as how silicone/lubrication levels impact seal quality. Variations in silicone quantity and distribution lot-to-lot can not only affect the amount of particles and protein aggregation in solution, but play a critical role in the injection performance when the PFS is intended for use in an autoinjector system. A thorough Design Verification Testing program is critical to demonstrate that the device doesn’t introduce a safety issue or compromise the performance/delivery of the drug. Prefilled Syringes Market worth 6.36 Billion USD by 2021, MarketsandMarkets, https://www.marketsandmarkets.com/PressReleases/prefilled-syringes.asp.